Is your wish list crowded with too many ideas for your cruise excursion in Italy? Not sure which one to choose? we understand, it’s quite difficult to decide, but if you have a one day stop at the port of Leghorn (Livorno) with your cruise we have some interesting suggestions for you! Small and classic ideas if it is your first time in Tuscany, and 3 great places to visit for you that are looking for something off the beaten paths. And if you want to try something different, not the same old excursion, we have some original excursions for cruise passengers you might be interested in. We offer you the opportunity to have a private tour experience (max 8 people) at the price of a regular tour. So, if your cruise stops for one day in the port of Leghorn where you can go to discover Tuscany?! Almost everywhere. Tuscany is not so big and you only have to pick a destination to have a real taste of it. 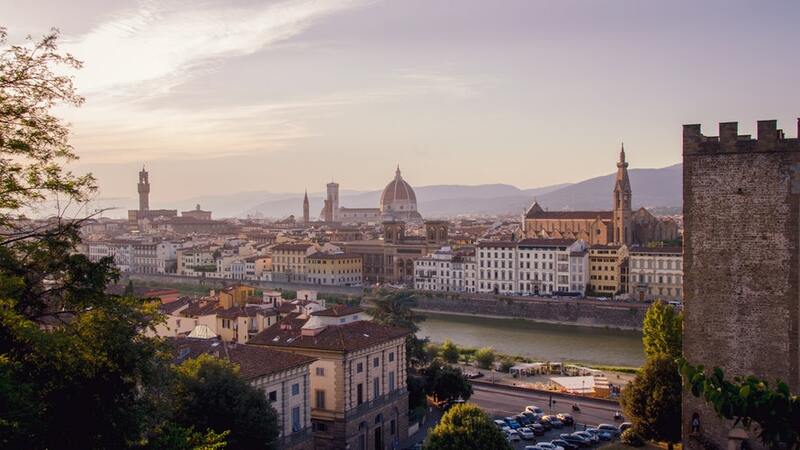 If it’s your first time in Tuscany you would probably prefer to visit its most famous cities: Florence, the cradle of Renaissance, the city of the Uffizi Gallery and Piazzale Michelangelo; or Pisa and its world-known Leaning Tower. If this is the case we have just the thing for you, we have a small group tour: from Leghorn port to Pisa and Florence with Uffizi visit. Try this one and you’ll be able to say at home, “I saw Tuscany”. And if you prefer nature and the seaside you can visit Cinque Terre: five small villages scattered, along a stretch of beautiful rocky coastline rimed by olive groves and lemon trees. To discover this seaside paradise overlooking the Mediterranean try out our shore excursion to Cinque Terre. But if you have already visited these renowned destinations why not try something different, something new? To discover the “real Tuscany”, wandering around the rolling hills and small villages, having a slow tasting tour of Chianti and other Tuscan wines? Don’t worry: we have 3 great suggestions for you. Just sit, read and dream! San Gimignano is a small town in the heart of Tuscany: an hour and a half from Leghorn and not far from Florence. Also known as the Manhattan of the Renaissance because of its numerous towers. In the past, 72 towers were built: important families used to build them as a way to declare their power and wealth and the towers of those families who lost that power were demolished. Now there are “only” 14 towers left, they are in perfect state, in a town that has preserved its Medieval structure. In the small streets and alleys , familiar shops will offer you a taste of the flavourful local products: the Vernaccia, the typical white wine of the San Gimignano area, an excellent rich in taste extra virgin olive oil from the countryside surrounding the town and, of course, tasty typical things to eat. The road to Volterra, a small town quite close to San Gimignano, is not just “panoramic”, it is a succession of breath-taking landscapes that, as you approach Volterra, shows something unique: the Crete Senesi. The appearance of these distinctive clay hills is different from everything around it: in a few kilometres, you’ll find yourself in a desertic view sprinkled with cypresses. And on a top of one of these hills here comes Volterra. Populated since the Iron Age, the town now hides pieces of its history everywhere: the Roman Theatre, the Etruscan Walls, Churches from Medieval times. And, at every corner, little shops full of alabaster eggs and Ombra della Sera statues. These are the typical, refined, craft pieces from Volterra. Wandering around its streets you can also taste typical food and great wine, sitting on a table admiring History. 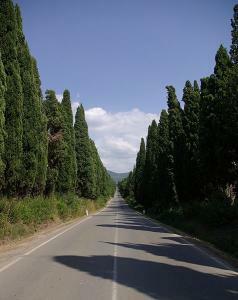 Thanks to the poet Giosuè Carducci we can visualize this long road framed by over two thousand cypresses. Travelling along this road finally Bolgheri appears in front of you: a tiny, cozy, Medieval village, known and loved by all Italians. If you have just one day for a shore excursion from Leghorn, Bolgheri is a great choice. 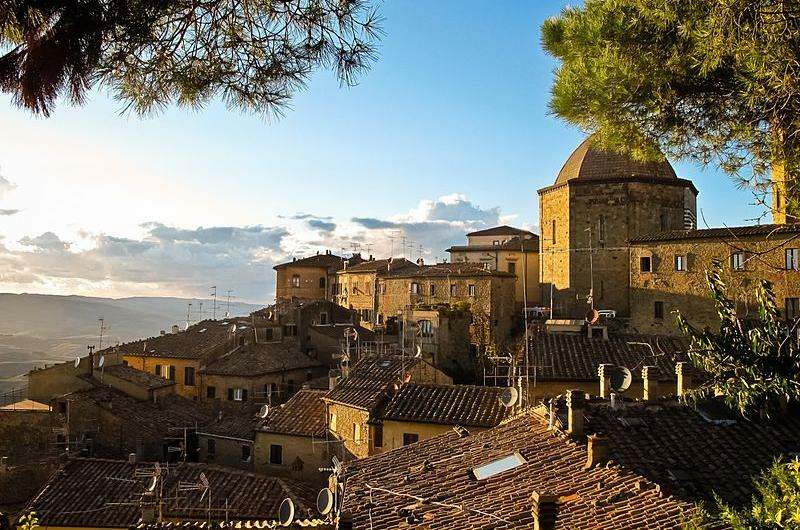 This small and tranquil town is perfect for anyone who needs a taste of the real Tuscany and the time to deeply enjoy its flavor. Bolgheri is in the middle of Costa degli Etruschi, a piece of that land in Tuscany, between Leghorn and Piombino, that once was home to the Etruscan civilization and now famous for its “Wine and Olive Oil Road”. So, along the road to Bolgheri, look around for a taste of Sassicaia, or passito or other great Tuscan wines. Next postWhat is the best Tuscan wine?